The Hollow Bone – Spiritually Awakening and Healing our Connection to the Earth, Ourselves and Our Community! A New Web Presence is being constructed, check back soon for a full new site! Welcome to The Hollow Bone! After studying and practicing shamanic ways since 1989, I left a 20 year restaurant career to follow my true passion and calling of Shamanic Service. In 2001 I and founded The Hollow Bone, a modest business whose purpose is to serve The Earth and our Relationship to Her. I believe the health of the planet depends on the wholeness of humanity--Humans need to be in a healed state and remember the inter-connectedness and Sacredness of all Life forms in order to reclaim our wholeness and place on this planet as Stewards and Caretakers. I believe that ancient shamanic principles and practices which came from a time when humans lived in harmony with the earth, are key to restoring our Sacred Balance now. I encourage you to explore this website to learn more about shamanism, shamanic healing and earth healing. There are articles and links that perhaps will bring answers to something you have been seeking! Check out our WORKSHOPS, I have resources listed for all levels of learning and many types of teachings! What does “hollow bone” mean? I first heard of the term ‘hollow bone’ from one of my teachers, cultural anthropologist, Angeles Arrien, author of The Four-Fold Way. Angeles described that this was an expression that came from some of the Native American tribes of the North West. Continue Reading…. Cross culturally, many indigenous tribes have used different metaphors such as: empty vessel, hollow reed or hollow bamboo. These metaphors reference being a clear and open channel for the Great Spirit to work through you. Shamans, being the mediators to the spirit world, need to continually work to maintain their ability to be this empty vessel, this Hollow Bone. It is a journey of integrity and impeccability. It is a path that is difficult-- as our ego is always challenging it. However the rewards are enormous. The Hollow Bone is the Path I have chosen to walk, and the Path I try to teach to my clients and students. This is why I chose this name. The Hollow Bone is dedicated to Spiritually Awakening and Healing our Connection to the Earth, Ourselves and Our Community. HEALING: I believe healing is at the core to moving out of a fear or anger-based way of living in this world. 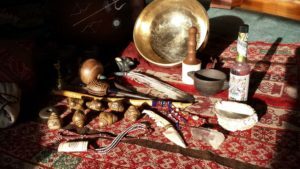 I use a broad range of both ancient and modern shamanic techniques to help clients feel whole again. This healing can be through private sessions, or in group apprenticeship programs (see Shamanic Healing Apprenticeship). EDUCATION: I believe education of shamanic principles and philosophies helps us shift our consciousness and be wise leaders in these changing times. Asides from the classes that I teach, I sponsor gifted and internationally known shamanic teachers, from many different traditions, whose teachings I believe support bringing wholeness and healing to humanity and our planet. EARTH: GAIA- Our Sacred Mother. I believe in teaching the old Earth-Ways of inter-connectedness with ALL LIFE. Shamans drew their spiritual strength from a deep sacred marriage with the Great Earth Mother. For in this spiritual union there was never aloneness or want, but instead comfort, companionship, visioning and nourishment of the soul. I believe this is something that must be reclaimed in order for humanity to survive. Our ancestors knew how to live in balance and harmony. Part of my teaching includes nature skills and relationship-building with the earth. Ana Hernando Larramendi was born in Spain and comes from Spanish and Basque ancestry. She is a full-time shamanic teacher and healer, with a private practice in Madison, Wisconsin. Ana has been studying shamanic traditions since 1989, her healing work includes: Soul Retrieval, Extraction, Depossession, Curse Unraveling, Ancestral Healing, Body-Centered Imprint Release, Illumination, Past-Life healing, space clearing and various land healing/balancing modalities. Ana has been a lecturer for the University of Wisconsin Medical School, as well as teacher and Peruvian guide for Madison Area Technical College. She is a founding member of the Society for Shamanic Practice and was a keynote presenter for their first annual conference (2005). Ana’s work has been published in The Journal of Shamanic Practice. Ana is an international teacher of shamanic healing practices. She is a minister, public speaker, Vision Quest leader, wilderness enthusiast, ceremonialist, chef, translator and an initiated mesa carrier in the Inka tradition. Ana has studied extensively with teachers from many traditions including: Alberto Villoldo (The 4 Winds Society), various teachers from the Foundation for Shamanic Studies, Weather Shamanism teachers; Nan Moss and the late David Corbin, Sandra Ingerman, Angeles Arrien, Betsy Bergstrom, Tom Cowan, Dr. Larry Peters, Marko Pogaĉnik and indigenous Alto Misayoqs of the Andes. She also studied for 6 years with Tom Brown Jr. of the TRACKER SCHOOL, learning tracking, survival and wilderness awareness skills. Ana has spent her life weaving together her spirituality with nature skills creating a skill-set of tools for land healing and teaching students to detect and heal earth trauma. Visit Hollow Bone's Facebook Page While this Site is Under Construction!